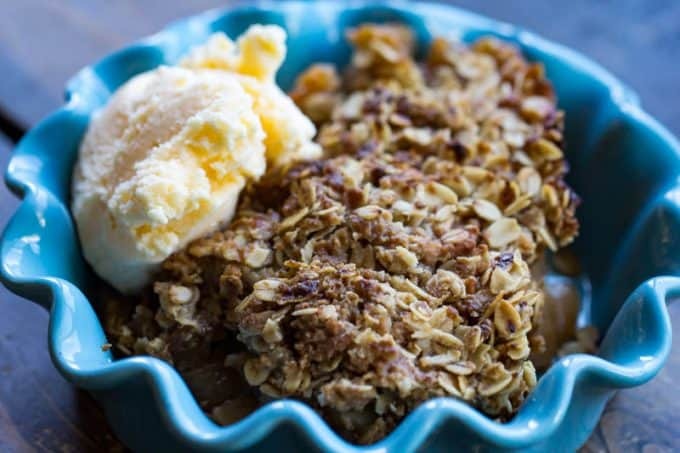 Traeger Apple Crisp is made with fresh, delicious apples, and topped with a crunchy sweet topping full of oats, brown sugar, flour, and copious amounts of butter. Desserts are a wonderful treat to serve after one of your delicious meals! 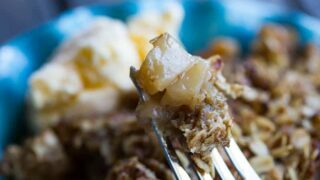 I know that I personally LOVE that little bit of sweetness to end a savory meal, and my Traeger Apple Crisp is the perfect dish! Apples are available all year round and are relatively inexpensive. 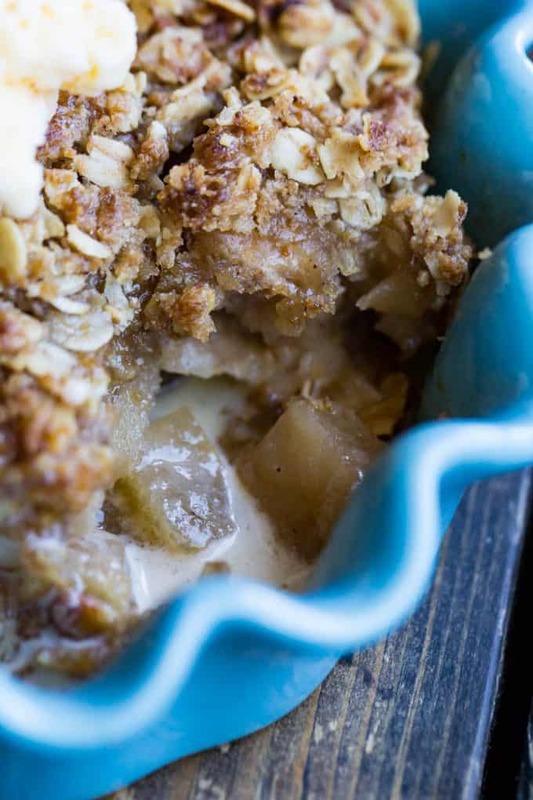 The ingredients in apple crisp are something everyone usually has in their pantry. 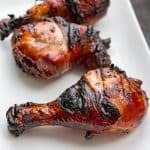 This is SO easy to throw together and pop it on the grill while your main course is cooking couldn’t be an easier way to accomplish an extra treat for all of your guests. What kind of apples do I use? Jonagold Apples: Tangy-sweet flavor. A blend of Jonathan and Golden Delicious apples. 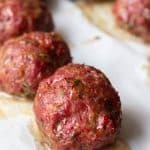 They hold up well in the oven, but don’t store as well as some others, so try to use them early in the fall at the peak of their season. Honeycrisp Apples: This one is my personal favorite, and was developed in Minnesota. They are great for eating, and they also have a wonderfully crisp texture so they are PERFECT for baking recipes. They are juicy and sweet with a hint of tartness. Braeburn Apples: Also with a sweet-tart flavor and wonderfully crisp. Also a great option for baking with. Granny Smith Apples: One of the most popular choices for baking. With their tart flavor and firm texture, they hold up very well in baking recipes. Perfect for apple pie! Golden Delicious Apples: These have a milder flavor but retain their shape after baking. A great all-purpose cooking apple. All of these varieties are readily available at any supermarket and the nice thing about apples is you can find them ANY time of the year. How long does this Apple Crisp need to bake on the grill? 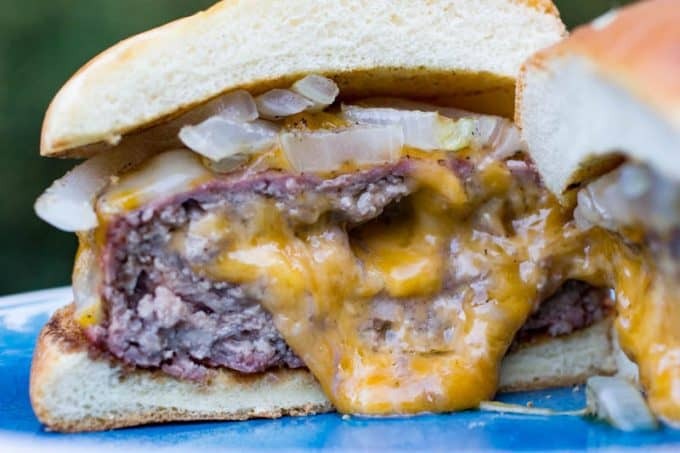 It takes about 45 minutes of grill time, and make sure to turn it halfway through cooking time! The apple crisp should be golden on the top, bubbling around the edges, and the apples should be tender when you poke a fork into it. How should I serve this Apple Crisp? As a GRAND Finale to any variety of meals! 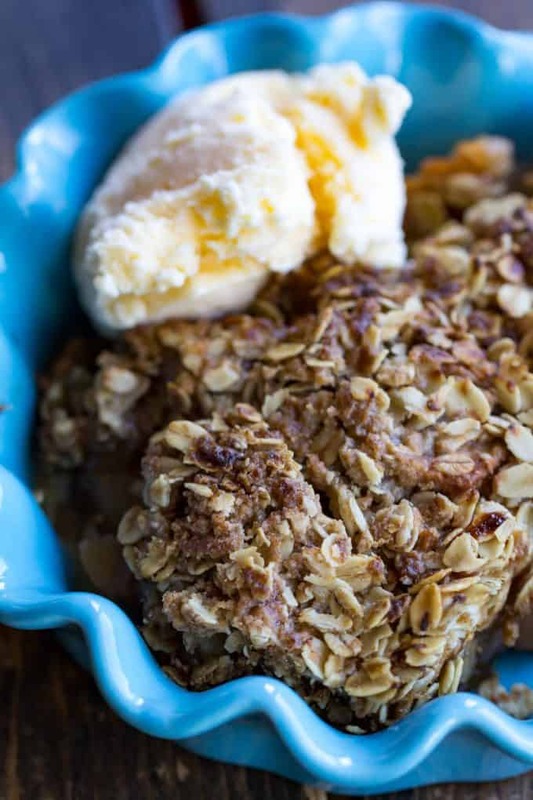 This Traeger Apple Crisp will pair well with almost any food and drink, so the sky’s the limit here. 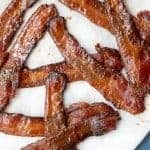 If you don’t have room on your grill, or don’t have a Traeger, this recipe will also work really well in an oven. 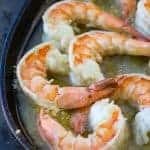 I personally love to serve this warm with a nice scoop of French vanilla ice cream or a warm bowl of caramel to drizzle on top, or BOTH! Whipped cream is also a great topping for apple crisp. What can I serve as the main course? 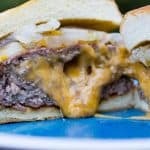 Here are some ideas for dinner to go along with this AMAZING dessert. These are just a few ideas to get you started, there are many more! 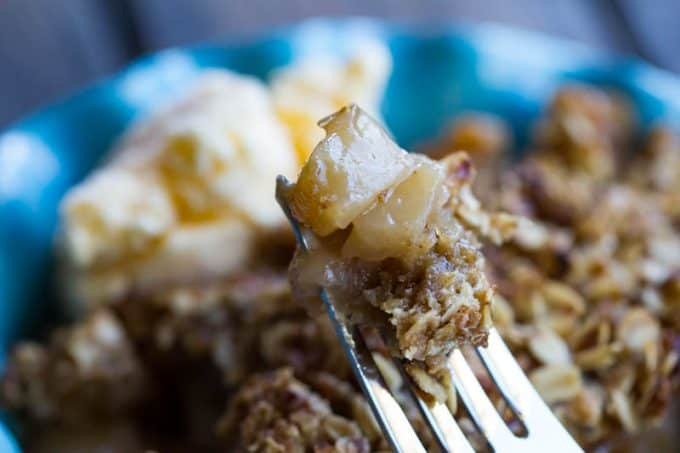 You won’t be disappointed in this Traeger Apple Crisp, it has everything that anyone could want and more. 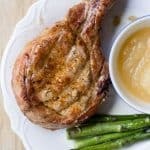 Sweet and tart apples in a warm cinnamon-spied sauce, and the hint of wood-fired flavor from baking on the Traeger will WOW your guests and bring this classic dessert to a whole new level. 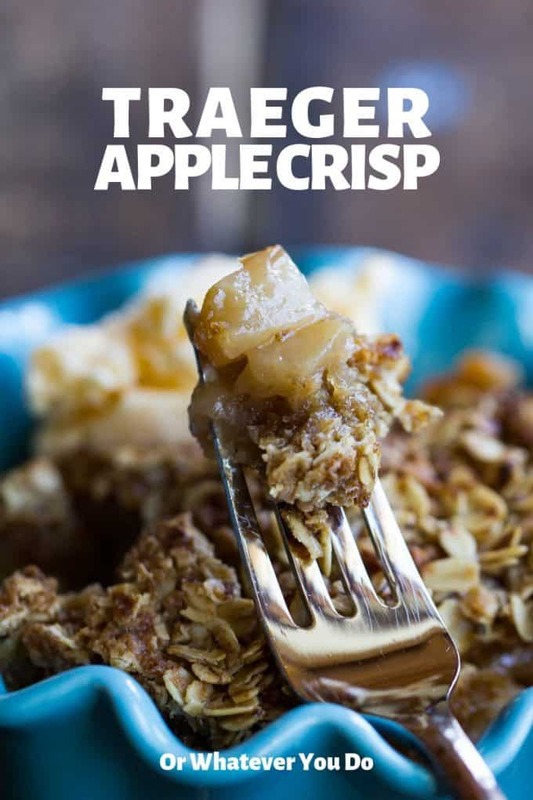 This delicious apple crisp is baked right on your Traeger wood-fired grill, includes enough dessert to feed your entire crowd, and is topped with a sweet, crunchy, oat topping. 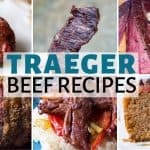 Preheat your Traeger according to manufacturer directions to 350°. Wash, peel, and core your apples. Dice into medium-sized cubes. Mix together 1/2 cup flour, 1 cup dark brown sugar, 1/2 teaspoon cinnamon, and toss in with the apples. 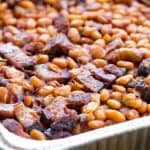 Liberally spray a 10x13 baking pan or a deep 10x12 foil grill pan with cooking spray. Place all of the apples inside, and place slices of the 1/2 cup butter all of the top of the apples randomly. Mix together the crisp topping ingredients until they are well combined, and place over the apples. Pat down gently if you need to. This makes a THICK top crust because I'm slightly obsessed with the crisp topping. If you get to a point where you are like OKAY ENOUGH, feel free to leave some aside. You can freeze it and use it at a later date. Place the crisp on the grill, making sure that it isn't over the hottest part of the grill. Check every 15-20 minutes or so, and adjust the placement of the pan to ensure for even cooking. Remove from the grill when the apples are tender and the topping is golden browned, and the edges are bubbly. Let sit for 20-25 minutes to let it set up, and then serve while still warm.